. 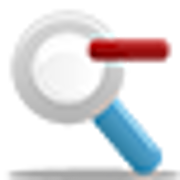 : Format නොකර Windows වල Hard Disk Partition Spaces බෙදමු | How to Split / Merge Hard Disk Partition Space without Formatting in Windows.? Format නොකර Windows වල Hard Disk Partition Spaces බෙදමු | How to Split / Merge Hard Disk Partition Space without Formatting in Windows.? ~ . Format නොකර Windows වල Hard Disk Partition Spaces බෙදමු | How to Split / Merge Hard Disk Partition Space without Formatting in Windows.? Android Wedakarayo Facebook Group එකේ කෙනෙක් අහලා තිබුණ ප්‍රශ්නයක් තමයි, මේ පහළ තියෙන්නේ... මුලින්ම ඒක බලලා ඉන්න. අපි අද කතා කරන්න යන්නේ, එ් ප්‍රශ්නයට නිවරදිව පිළිතුරක් ලබා ගන්න විදිහ ගැනයි. ඔයාලගේ Hard Disk එකේ වෙනත් Partition එකක තියෙන ඉඩක්, තවත් Partition එකකට Share කරගන්න විදහ තමා සරලම මෙහිදින් කතා කරන්නේ. උදා : ඔයාගේ C: Partition එකේ Free Space 1 GB වෙලා තියෙනවා. 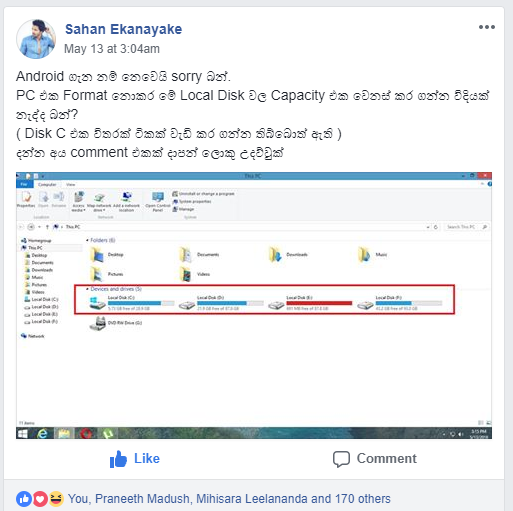 D Partition එකේ 50 GB ක් Free Space තියෙනවා. 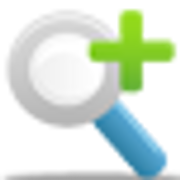 ඔයාට ඕනි වෙනවා D: Partition එකෙන් - C: Partiiton එකකට 30 GB ක් Share කරගන්න. දැන් 100%ක් පැහැදිලි වෙන්න ඇති. 01. ඉඩ අඩු Partition එකක Space එක වැඩි කර ගමු. මේ Software එක Open කරගත්තම ඉහත රෑපයේ වගේ ඔයාගේ Drive list එක පෙන්වනවනේ, ඒකෙන් ඉඩ ගන්න යන F: Drive එකේ Right Click කරන්න. Allocate Free Space යන්න Click කරන්න. From (F:) to List එකෙන් C: Drive එක ලබා දෙන්න. (ඔයාට Free Space එක Share කරන්න ඕනි වෙන Drive එකකට නම් ඒ හරි Drive එක ලබා දෙන්න. දැන් Apply කරන්න. මේ Progress එක අතරතුර Computer එක කිහිපවරක් Restart වෙන්න පුලුවන්. Black Screen එකක් ඇවිත්, ලොකු Process එකක් පෙන්වනන් පුුලුවන්. බය වෙන්න එපා.. ඒ සියලුම දේවල් වෙනකම් පරිගණකය Current එකට Plaug කරලා තියන්න. මේ ගැන වෙනත් ගැටලුවක් තියෙනවනම් පහළින් Comment එකක් දාගෙන යන්න. තව ගොඩාක් ඔයාගේ යාලුවන්ටත් මේ ප්‍රශ්නය තියෙනවනම් ශෙයා කරගෙන යන්න.